How To Increase Conversions On Your Facebook Ads————————————-Your Daily Dose of Business | Episode #3…let's dive in 👇👇———————————————-There are a couple of things that you can do in order to increase conversions on your Facebook ads. The biggest mistake that most people make is that they try to present something in front of a cold audience. The best strategy that we found is the following one: 📝📝👇✅Step 1: You Need To Make Sure You Start With A Video Ad and if you haven’t run a video ad before, just to get views, I am happy to let you know that you can have a campaign that, you know, generates video views for your product or service or whatever you do. So, what you have to do is pay cents per views, like literally, one or two cents per view, so that’s completely insane! Of course, a video needs to be related to the product that you are planning to sell because the video is going to create an audience for you, right? This applies a lot to the people that aim to hit a cold audience because now, they are going to be warmed up with the video that is put out there.People are going to watch it. Of course it depends a lot on the audience or on what exactly you are telling them, so, for example if you are selling a product that is related to tennis, then you may want to record two or three videos in which you are talking about how to get better at tennis so to give them an idea… and this is just step number one.———————————————-✅Step 2: Creating a 2nd video in which you are going to go deeper in the subject. For example, if at the beginning of the first video you talk about the strategy on how to get better at whatever the service is, now, in the second video, you should talk about tips. Show tactics, because you are creating now an audience made of people that watched at least 25% of your first video. In the beginning, there is going to be a cold audience, but now you are narrowing it down a little bit, because people that watched at least 25% of your first video, are going to watch the second one, right?———————————————-✅Step 3: includes a third video in which you start the transition from the strategy and tactics to explaining the benefit of your product or service, whatever it is. You have to talk about the benefits of your services or your products. The main strategy behind this is that the second video is only watched by those who watched only 25% of your first video and now the third video is going to be watched by those who watched 50% of your second video. Now people are going to get more familiar with you. ———————————————-✅Step 4 The fourth step includes putting an offer out there. It would be highly recommended that the fourth step includes a video too, which serves as a guide for those who are watching it. Now, the audience is super targeted, because they have watched the previous videos as well. Believe me or not, it is not going to be as expensive as most people think to do the entire strategy because you are actually paying Facebook only for video views and those are super cheap.———————————————-All things considered, these are the main steps that should be followed in order to increase conversions on your Facebook ads, and the main reason for this is that all these ads are going through their feed. I hope you found this blog helpful and… stay tuned! There will be more! 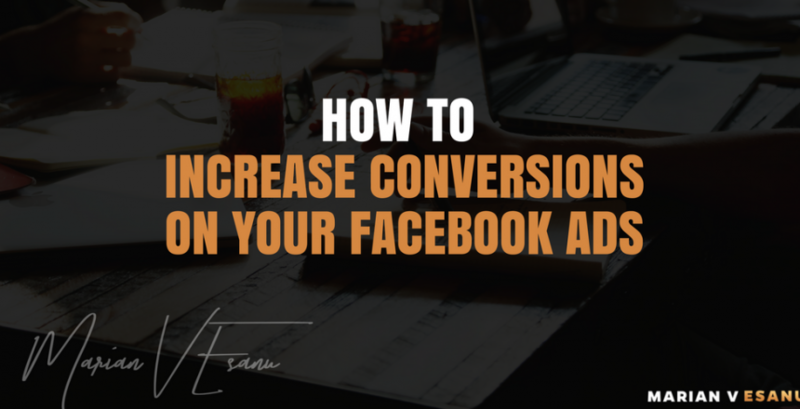 There are a couple of things that you can do in order to increase conversions on your Facebook ads. The biggest mistake that most people make is that they try to present something in front of a cold audience. The best strategy that we found is the following one: YOU NEED TO MAKE SURE YOU START WITH A VIDEO AD and if you haven’t run a video ad before, just to get views, I am happy to let you know that you can have a campaign that, you know, generates video views for your product or service or whatever you do. So, what you have to do is pay cents per views, like literally, one or two cents per view, so that’s completely insane! Of course, a video needs to be related to the product that you are planning to sell because the video is going to create an audience for you, right? This applies a lot to the people that aim to hit a cold audience because now, they are going to be warmed up with the video that is put out there. People are going to watch it. Of course it depends a lot on the audience or on what exactly you are telling them, so, for example if you are selling a product that is related to tennis, then you may want to record two or three videos in which you are talking about how to get better at tennis so to give them an idea… and this is just STEP #1. STEP #2 includes creating a second video in which you are going to go deeper in the subject. For example, if at the beginning of the first video you talk about the strategy on how to get better at whatever the service is, now, in the second video, you should talk about tips. Show tactics, because you are creating now an audience made of people that watched at least 25% of your first video. In the beginning, there is going to be a cold audience, but now you are narrowing it down a little bit, because people that watched at least 25% of your first video, are going to watch the second one, right? STEP #3 includes a third video in which you start the transition from the strategy and tactics to explaining the benefit of your product or service, whatever it is. You have to talk about the benefits of your services or your products. The main strategy behind this is that the second video is only watched by those who watched only 25% of your first video and now the third video is going to be watched by those who watched 50% of your second video. Now people are going to get more familiar with you. STEP #4 includes putting an offer out there. It would be highly recommended that the fourth step includes a video too, which serves as a guide for those who are watching it. Now, the audience is super targeted, because they have watched the previous videos as well. Believe me or not, it is not going to be as expensive as most people think to do the entire strategy because you are actually paying Facebook only for video views and those are super cheap. All things considered, these are the main steps that should be followed in order to increase conversions on your Facebook ads.